It was snowing when I left Colorado on my annual May pilgrimage to Idaho for quilt retreat! I had a hard time believing how warm it was in my hometown of Jerome, Idaho. For the first time, I attended "Room to Learn's" retreat at the Monastery of the Ascension in Jerome. The monastery is lovely, so peaceful and remarkably isolated -- even though it's just a few miles from my high school! 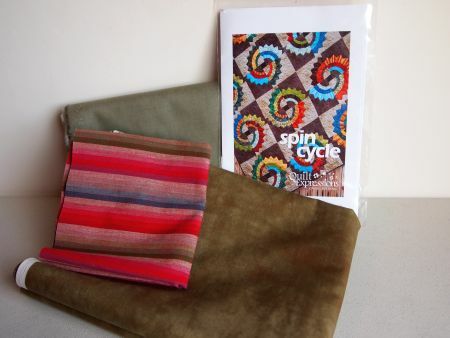 Julia does an incredible job setting up for serious sewing. Five Oliso irons, five "big board" ironing boards, three portable design walls -- and wine tasting each afternoon! Yep, I'll be back! 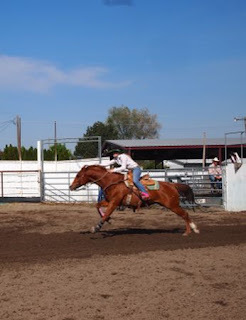 In between quilt camps, I attended the High School rodeo in Homedale, Idaho. My great-niece, Bekah, rode in four events, wearing a western shirt made by her Mamma! Bekah's High School Rodeo team sold raffle tickets for this quilt, made by yours truly. She reports they earned more than $1000 for their college scholarship fund! On the way back to Colorado, I did some serious quilt shop-hopping. I visited several new shops. First, a lovely country shop outside Shoshone, Idaho. 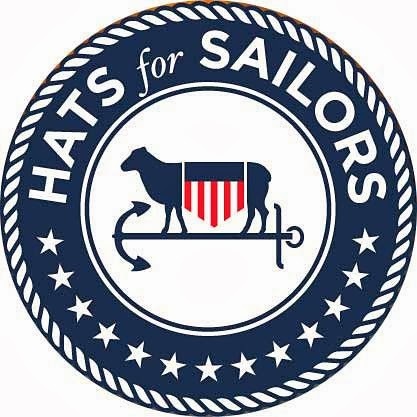 Salli's Back Porch offers fabric, haircuts, and massages! 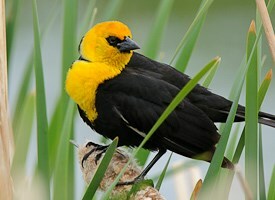 Plus, the surrounding countryside is beautiful -- I saw a golden-headed blackbird, one I'd never seen before! 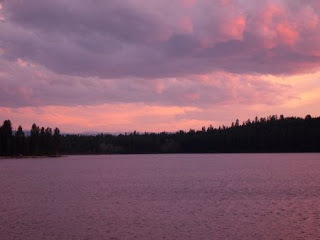 Salli has an online shop, so if Idaho isn't in your travel plans, you can visit her shop vicariously via the interweb! Another shop I've been want to visit forever is The Charm Shack in Ontario, Oregon. What a great selection! I scored a wonderful handmade ruler holder to keep on my cutting table to hold the little rulers and templates I use most often. Plus, in Oregon, they pump the gas into your car for you! I was sad that the shop in Nyssa, Oregon, was closed for the day. Next time, maybe! 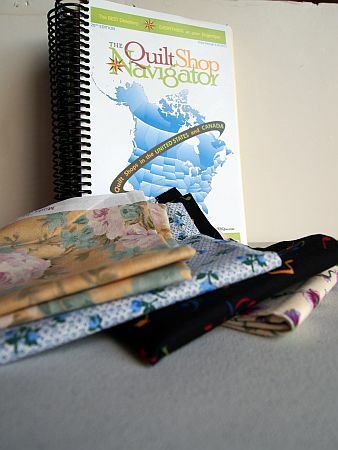 Another shop I'd never visited is My Heritage Fabrics, also in Ogden. It was a little challenging to find, since the Quilters Club of America's iPhone app is not up-to-date, but worth it! This shop knows how to host a sale! Of course, it was upon leaving this shop that I got well and truly lost in Northern Utah. Well, not really lost, but I didn't know Hwy 39 was still closed for snow. And I didn't have a Utah road map. And my GPS still thought I was in Filer, Idaho! OK, enough about traveling. What did I buy? First off, do you read Quilt Sampler magazine? 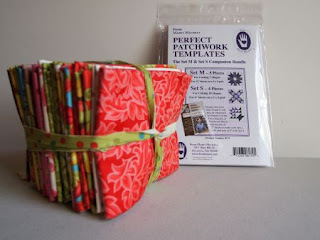 Like the quilt on the cover? 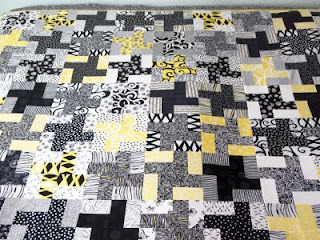 My quilt camp buddy, Martha, made this quilt while we were at camp. 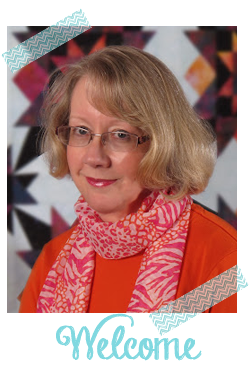 (Come back next Saturday to see her finished quilt in the May UFO parade.) 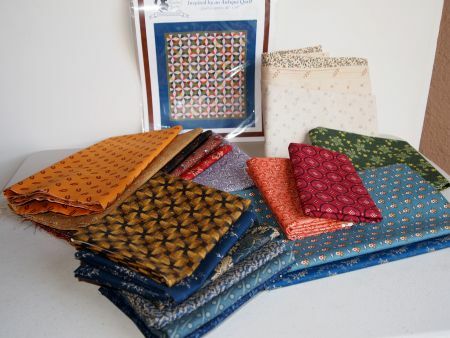 I bought only the pattern and background fabrics, and I plan to add my Malka Dubrawsky and Kaffe Fassett fabrics to make the Dresden blocks. I fell in love with this Bonnie Blue Quilts pattern at Stylish Fabrics. It gave me the excuse to shop for more Civil War Reproduction fabrics! 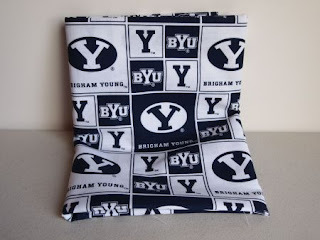 One of my great-nieces will be attending BYU in the Fall. 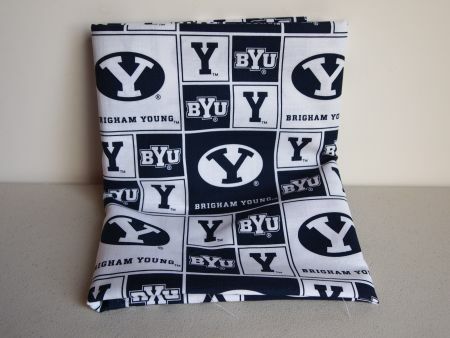 I was excited to find this for a pillowcase to send along with her! Julia demonstrated the newest Block-Loc ruler. 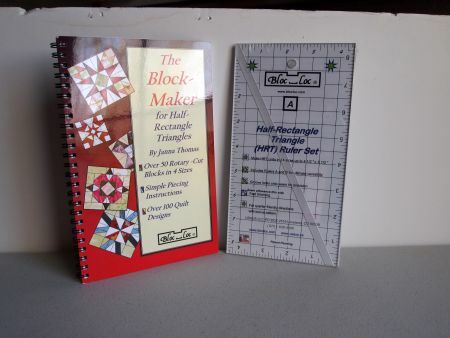 The designers also published a book showing blocks that can be made with this new tool (come back on a future Tuesday for my own Tuesday Tool post featuring it). 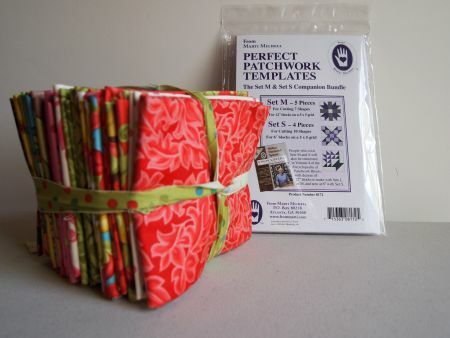 Speaking of fat quarters, here is the fat quarter collection I'm offering to the winner of my 500 followers giveaway. Go to this post to comment for your chance to win! It's a long weekend in the USA for Memorial Day. 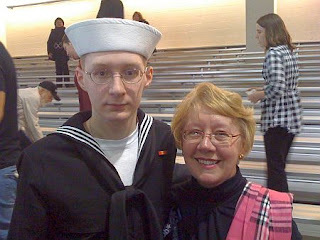 I hope you'll take the time to thank a service member, current or former, for their service to our country! Sounds like a lot of fun - fabric & massage - I could do that! A long road trip, but looks like it was lovely! Okay....that sounds like a GREAT retreat!!! Wine, Oliso and quilting too?? How much better does it get? What was the eating place in Evanston? We are heading there this week. What a fantastic trip! It makes me want to take a road trip and visit all those quilt shops you went to. Your fabric finds and quilt patterns are going to be fun to make! Hi Marti! I was just at My Heritage Fabrics a few weeks ago! We were visiting my husband's aunt who lives in Clearfield and she took me there. They had a great selection. Plus we ate at the restaurant there at Rainbow Gardens, enjoyed walking through all the shopping, and then went across the street to the Dinosaur Park! Neat area!